With the various discussions surrounding the future expansion of London airports, it seems to be forgotten that the rest of the United Kingdom also has its fair share of airports. These smaller facilities are considered backwaters by many, yet for those who live in the surrounding areas they are both a useful asset and a sense of great pride. Take Birmingham International Airport as an example. As the Midlands airport prepares to celebrate its 75th birthday, the former ‘Elmdon’ recently marked another significant milestone when it welcomed its two hundred millionth passenger. The airport was officially opened on a rainy Saturday on the July 8, 1939 by HRH The Duchess of Kent, but just two months later the Second World War broke out and the Air Ministry requisitioned the airport so all civil flying was stopped. On Monday 8th July 1946, exactly seven years after the airport’s official opening, the facility was reopened for civil flying and over the next seven and a half decades more than 200 million people have used the airport. The original Elmdon terminal still stands proud on the western side of the airfield but the rapid growth in air travel in the 1970s meant a new terminal building was opened by HRH The Queen on the May 30, 1984. Although now twice the size, this remains the site for Birmingham Airport’s operation, which today sees more than nine million passengers use the facility each year. 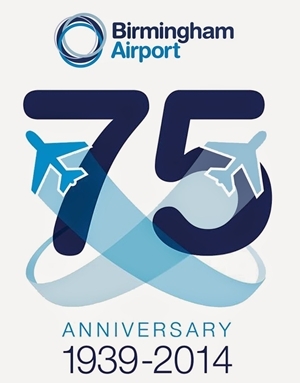 Commenting on the milestone (and the launch of a commemorative logo to use throughout the year), Paul Kehoe, Chief Executive of the Airport, said: “Birmingham Airport has played an important role in the success of the region for 75 years. It was built with the aim of creating jobs and stimulating industry; and that it has certainly done. This spring, the airport opened its extended runway which allows airlines to fly further than ever before from Birmingham, including the Far East, the Americas and South Africa. Instead of concentrating on the London-centric airports, perhaps we should focus some attention on these unsung heroes and spread the investment, the jobs and the environmental impact across the entire UK?